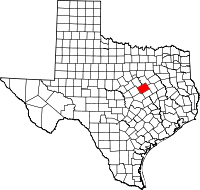 McLennan County is a county located on the Edwards Plateau in Central Texas. As of the 2010 census, its population was 234,906. Its county seat is Waco. The U.S. census 2018 county population estimate is 254,607. The county is named for Neil McLennan, an early settler. McLennan County is included in the Waco Metropolitan Statistical Area. McLennan County was created by the Texas Legislature in 1850 out of Milam County. The county seat, Waco, had been founded as an outpost of the Texas Rangers. It was laid out by George B. Erath, and was known by 1850 as Waco Village. Popular carbonated beverage Dr Pepper was developed in Waco by pharmacist Charles Alderton in the 1880's. Dr. Pepper was headquartered in Waco, until moved to Dallas, Texas. Waco is also home to the Dr. Pepper Museum, housed in the 1906 building that was the first stand-alone facility used to bottle Dr. Pepper. According to local lore, the first sustained flight did not occur in Kitty Hawk, North Carolina, but just outside Tokio (a small community in McLennan County) by a man flying a gyrocopter. During World War I, McLennan County was home to at least one military airfield, Rich Field. In the aftermath of World War I, when social tensions were high as veterans returned, white racial violence broke out against blacks. Two major Ku Klux Klan marches (one in Waco and another in Lorena) took place, demonstrating the revival of the Klan since 1915. Public lynchings by Whites of numerous Black citizens occurred; McLennan County had a total of 15 lynchings from 1877 to 1950, most around the turn of the century. This was the second-highest total of any county in Texas, where lynchings were widespread. The spectacle lynching of Jesse Washington outside Waco city hall in May 1916 was the most egregious of these extrajudicial murders; his lynching was publicized and attracted 10,000 attendees. The brutal torture and murder of Washington by burning became known as the "Waco Horror", and was nationally criticized by the press. In the 1990s, the Waco City Council and the McLennan County Commissioners Court discussed passing a resolution to memorialize this lynching, but they did not act. In May 2016, a mayor of Waco formally apologized to Washington's descendants and the Black community, in a centenary ceremony to mark the anniversary of his lynching. A historical marker is being erected to acknowledge the lynching. McLennan County's contributions to World War II include the reopening of Rich Field for use by the Air Force, and the opening of James Connally Air Force Base, now the home of TSTC Waco Airport and Texas State Technical College. Doris Miller from the county was awarded the Navy Cross for his heroism at Pearl Harbor; he was the first African American to earn such distinction. Local man James Connally became known as a World War II fighter pilot. In 1886, Baylor University relocated from Independence, Texas, to Waco and absorbed Waco University. During the early 20th century, McLennan County was home to as many as five colleges; in addition to Baylor, the other colleges included the predecessor to what is now known as Texas Christian University (now in Fort Worth), Paul Quinn College (relocated since to Dallas), and two other short-lived colleges. In the 1960s, the Texas Legislature authorized McLennan Community College, the first community college to use those words in the name. Around the same time, what is now the flagship institution of Texas State Technical College was founded as James Connally Technical Institute, as a member of the Texas A&M University System. Today, Baylor, McLennan Community College, and Texas State Technical College continue to operate in McLennan County. They educate a large portion of the college-bound high school graduates from the county and the surrounding areas. McLennan Community College has also partnered Tarleton University, Texas Tech University, University of Texas Medical Branch in Galveston, and Midwestern State University to offer more than fifty bachelors or masters year degrees. Crush, Texas, was a short-lived town in McLennan County, about 15 miles (24 km) north of Waco. It was established to stage a publicity stunt concocted by William George Crush and the Missouri-Kansas-Texas Railroad. The stunt involved the collision of two 35-ton steam locomotives in front of spectators, whom the railway transported to the event for $2 each. After strong promotion, on September 15, 1896, the event was delayed by several hours as the police maneuvered the crowd of more than 40,000 back to what was thought to be a safe distance. The crews of the two engines tied the throttles open and jumped off. The two engines, pulling wagons filled with railroad ties, traveled a 4-mile (6.4 km) track and thunderously crashed into each other at a combined speed up to 120 mph (190 km/h). The boilers exploded and sent steam and flying debris into the crowd. Three people were killed and about six were injured, including event photographer Jarvis "Joe" Deane, who lost an eye because of a flying bolt. Ragtime composer Scott Joplin commemorated the event with "The Great Crush Collision March"; Joplin dedicated the composition to the Missouri-Kansas-Texas Railway. Texas composer and singer Brian Burns wrote and recorded a song about the collision, "The Crash at Crush" (2001). In May 17, 2015, motorcycle clubs gathered at the Twin Peaks Restaurant in Waco for a Confederation of Clubs meeting. Upon arrival of a large contingent of the Bandidos Motorcycle Club, mass violence erupted in the parking lot of Twin Peaks between members of the Bandidos and members of the Cossasks Motorcycle Club. This resulted in 9 dead and 18 wounded in the melee between the rival outlaw motorcycle gangs. Twenty-Six bikers still have pending charges in the county's two District Courts that hear felonies. According to the U.S. Census Bureau, the county has a total area of 1,060 square miles (2,700 km2), of which 1,037 square miles (2,690 km2) are land and 23 square miles (60 km2) (2.2%) are covered by water. As of the census of 2000, 213,517 people, 78,859 households, and 52,914 families resided in the county. The population density was 205 people per square mile (79/km²). The 84,795 housing units averaged 81 per square mile (31/km²). The racial makeup of the county was 72.17% White, 15.19% Black or African American, 0.49% Native American, 1.07% Asian, 0.05% Pacific Islander, 9.21% from other races, and 1.83% from two or more races. About 17.91% of the population was Hispanic or Latino of any race; 12.8% were of German, 11.0% American, 8.0% English, and 6.9% Irish ancestry. Of the 78,859 households, 33.00% had children under the age of 18 living with them, 49.70% were married couples living together, 13.60% had a female householder with no husband present, and 32.90% were not families. About 26.00% of all households were made up of individuals, and 9.70% had someone living alone who was 65 years of age or older. The average household size was 2.59 and the average family size was 3.15. In the county, the population was distributed as 26.60% under the age of 18, 14.60% from 18 to 24, 26.40% from 25 to 44, 19.50% from 45 to 64, and 12.90% who were 65 years of age or older. The median age was 32 years. For every 100 females, there were 94.10 males. For every 100 females age 18 and over, there were 90.20 males. The median income for a household in the county was $33,560, and for a family was $41,414. Males had a median income of $30,906 versus $21,978 for females. The per capita income for the county was $17,174. About 12.40% of families and 17.60% of the population were below the poverty line, including 20.70% of those under age 18 and 11.30% of those age 65 or over. ^ a b "State & County QuickFacts". United States Census Bureau. Archived from the original on July 14, 2011. Retrieved December 21, 2013. ^ Gannett, Henry (1905). The Origin of Certain Place Names in the United States. U.S. Government Printing Office. p. 194. ^ a b "The Crash at the Crush". Texas Historical Commission. Archived from the original on 2015-11-21. Retrieved 26 November 2011. ^ "U.S. Decennial Census". United States Census Bureau. Archived from the original on May 12, 2015. Retrieved May 4, 2015. Wikimedia Commons has media related to McLennan County, Texas. Read Neil McLennan's entry in the Biographical Encyclopedia of Texas[permanent dead link] hosted by the Portal to Texas History.